Joe tells us about a specific “hell gig” story that he had to endure where he was getting paid too little for too much, and was generally just a horrible experience. Solving the world’s largest corn field maze blindfolded! • Talks about his first venture into getting publicity. • Tips where he got his idea for the blindfold corn maze walk. Hint: It’s Corinda’s! • If you fail a stunt, the only people that will know are you and the reporter. And you can always find another reporter! • Getting the word out about your stunt. • Getting the photos and videos of your stunt. • Be safe! Do your due diligence. You don’t have to do something dangerous. Joe has never done anything dangerous in his stunts. • Touch on Joe’s venture into a “Pay What You Want” pricing structure. 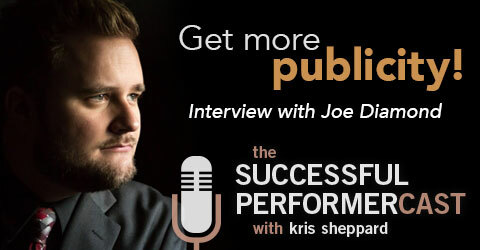 Joe offers consulting on publicity and publicity stunts. Shoot him an email for more info. Use your camera phone to get video of your show and video testimonials. Where can we find Joe Diamond?